Princess & the Paper presented by A Jillian Vance Design: Welcome to the AJVD Springtacular Blog Hop! 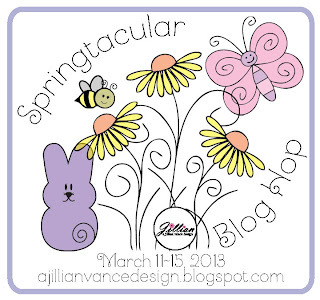 Welcome to the AJVD Springtacular Blog Hop! This week we hope you Hop along with us while we celebrate Spring here in A Jillian Vance Design Land! Using Pastels, check out what my creative and talented designers have created for you! I absolutely love this card. I used a really cool embossing powder I got at Summer CHA 2012 to create a cool effect with the Background Builder background stamp I used! Below this is the recipe, then below that is the A Jillian Vance Design products I used! This one is one of my favorites- I absolutely LOVE the little chick and Happy Spring! 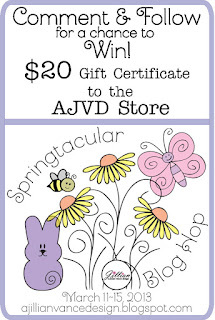 Thanks for stopping by today and don't forget to visit the AJVD Blog to Comment & Follow and WIN! when you are done hopping! Time to Hop on over to the Bunny Runs with Scissors. For rules to enter and WIN! I just love that swirly bg. Love how you colored the eggs on the tree Jilly and your tag is so cute with the pear clip! Love the little egg tree! I so need that stamp set! Great cards Jillian, I love the swirl embossed background builder . Darling Cards! 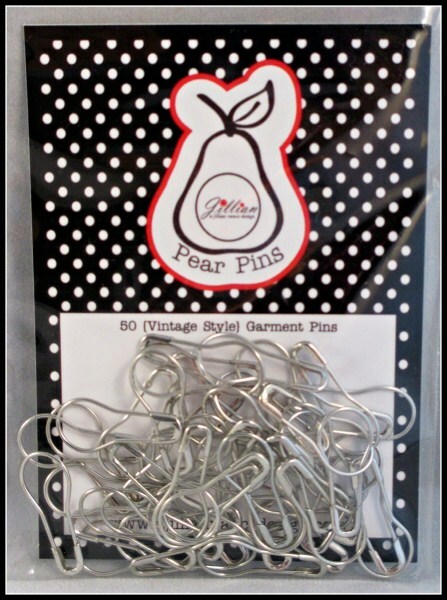 Love how your used the pear pins!! What adorable images, cute stuff! These cards are just ADORABLE!! I am definitely going to have to get the foto frames! Loving the egg tree too!! Love, love, love the swirl background and that great embossing powder you used. The other background looks great with that little chick, too. You did a great job showcasing these sets. Great cards Jillian! Love your embossed sunburst! I am so loving that sunburst background stamp. And great job with pulling off such a good looking pink card. Perfect for Easter! Both cards are adorable, but I'm really loving that swirl background and the cute little Easter Egg Tree! Super cute cards! Love that Stampendous embossing enamel on the first card! It's one of my favs! 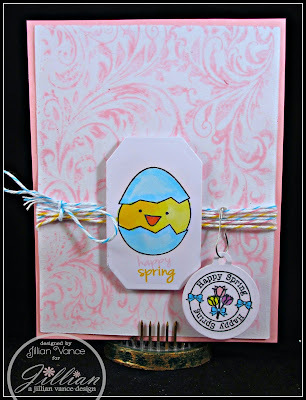 Such sweet cards - I love that Easter stamp set! 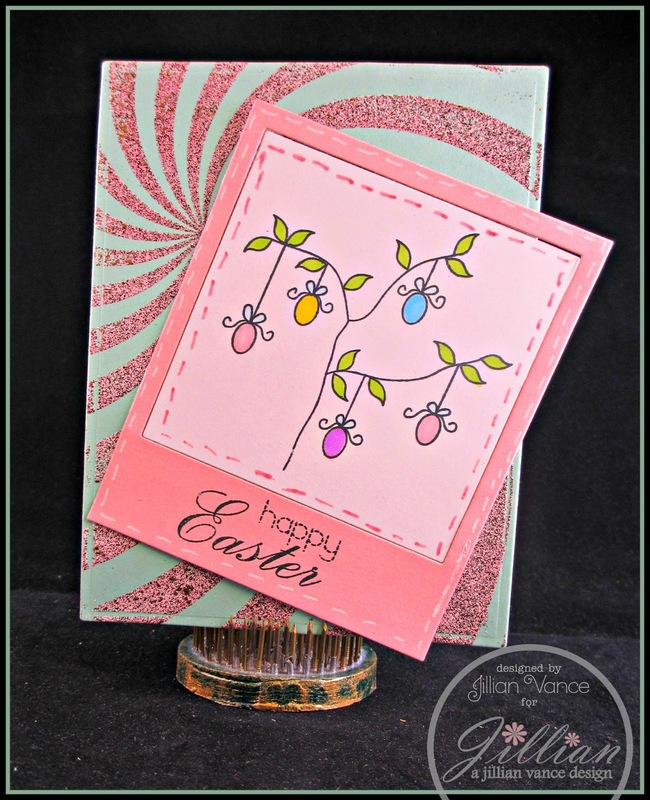 Ooh, esp love the swirl background and egg tree card! I love the egg tree. It is so cute. I love the eggs in the tree. I love the pic frame dies. So cool. What a cute stamp! Love the cards!!! THese are fabulous and the colors get me ready for Spring! yay! The chicky looks so cute! The twine is great, too. Great Cards! I love it all! !